Product prices and availability are accurate as of 2019-04-21 10:35:25 UTC and are subject to change. Any price and availability information displayed on http://www.amazon.com/ at the time of purchase will apply to the purchase of this product. MATS SUNDIN / TORONTO MAPLE LEAFS 1996 NHL Starting Lineup Action Figure & Exclusive Collector Skybox Trading Card. Displayed figure stands approximately 4 inches. Ages 4 and up. From Kenner. Mats Johan Sundin (born February 13, 1971) is a retired Swedish professional ice hockey player. 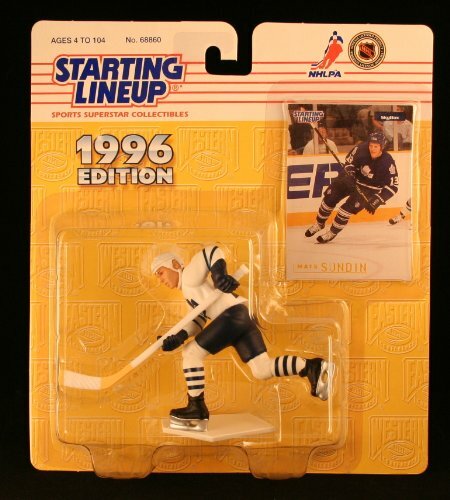 Originally drafted first overall in 1989, Sundin played his first four seasons in the NHL with the Quebec Nordiques. He was traded to the Toronto Maple Leafs in 1994, where he played the majority of his career, serving 11 seasons as team captain. At the end of the 2007-08 NHL season, Sundin had been the longest serving non-North American born captain in NHL history. Sundin last played for the Vancouver Canucks in the 2008-09 season before announcing his retirement on September 30, 2009. Consecutively he played 13 of his 18 NHL seasons with the Toronto Maple Leafs. He appeared in the NHL playoffs in 10 seasons. Excluding his rookie season, the shortened lockout season and his half season with the Vancouver Canucks, Sundin scored at least 70 points in every season of his career, played at least 70 games in every season, and led the Leafs in points in every year he was with the team except 2002-03, when Alexander Mogilny beat him by seven points. On October 14, 2006, Sundin became the first Swedish player to score 500 goals. He is the Leafs' franchise all-time leader in goals (420) and points (984). 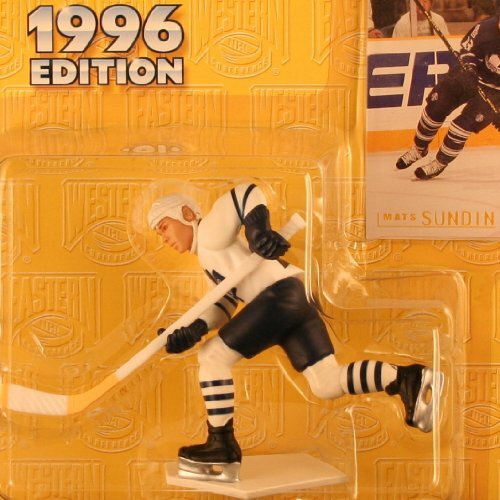 Over his career, Sundin averaged just over a point per game (1349 points in 1346 NHL games). Toronto Maple Leafs Ice Hockey is a participant in the Amazon Services LLC Associates Program, an affiliate advertising program designed to provide a means for sites to earn advertising fees by advertising and linking to Amazon.com, Endless.com, MYHABIT.com, SmallParts.com, or AmazonWireless.com. Amazon, the Amazon logo, AmazonSupply, and the AmazonSupply logo are trademarks of Amazon.com, Inc. or its affiliates.